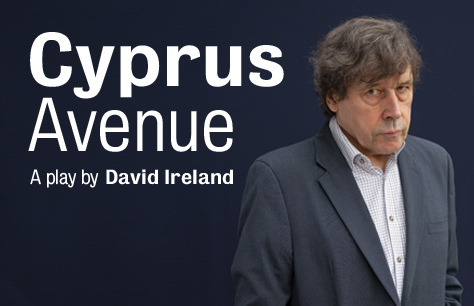 Tickets for Cyprus Avenue in its return to the Royal Court Theatre are now available! Do not miss your chance to see award winning actor Stephen Rea in David Ireland's award winning drama. Winner of an Irish Times Theatre Award for Best New Play and the James Tait Black Prize for Drama in 2017, David Ireland’s Cyprus Avenue has been called one of the most important pieces of theatre of our times. After a sold out debut run at Royal Court Theatre and transfers to New York, Dublin and Belfast, Cyprus Avenue returns to the Royal Court Theatre for a limited 4 week run. This absurd and disturbing black comedy sees tour de force Irish actor Stephen Rea reprise his Irish Times Best Actor winning role as Eric Miller, a Belfast Loyalist. This seemingly put together old man is fighting against the past and petrified of the future. He can’t help but believe that his cultural heritage is under attack and though his family tell him to live in the present and let go of long-dead battles, Eric is certain that the past has returned in a very real way. He is convinced his 5 week old granddaughter is former Sinn Fein leader Gerry Adams, and doesn’t understand why no one else can see the truth. Cyprus Avenue tickets at London’s Royal Court Theatre are sure to sell out quickly to this limited run return of this incredible production. Book Cyprus Avenue tickets now to guarantee the best seats at the best prices.